or replacing home appliances and systems when they break down. We're sorry, no plans are available in your state. 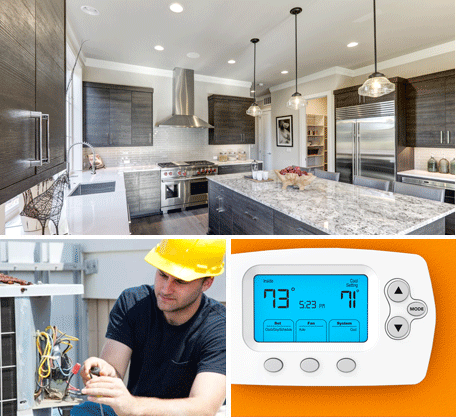 A home service plan helps cover the expense of repairing or replacing home appliances and systems when they break down from everyday use. Select your deductible. Your monthly premium changes based on the deductible you select. Plumbing repairs aren't cheap. Cover internal pipes, drains, garbage disposal, and stoppages.. Tank or tankless, you're covered. Even failures caused by sediment are covered. .
Leave the tinkering to us. Tanks, bowls and toilet mechanisms within the tank are covered..
See terms, conditions and limitations in your Service Plan Agreement that you can review once we receive your enrollment request and send you your materials. Covered items must be in good working order, with no apparent visual or operational malfunctions, on your Agreement effective date. Deductible/Service call fee due at time of service. This fee is separate from the monthly plan premium. Non-covered and incidental charges may apply to certain repairs or replacements. If you cancel after the effective date you may be responsible for any costs associated with claims processed during the term of your Agreement prior to cancellation. Benefits may vary by state. Not available in all states; subject to sales tax where applicable. The HomeSure Companies and Cross Country Home Services, Inc. are not affiliated in any way with BBVA Compass Insurance Agency, Inc., its affiliates or subsidiaries. Insurance products and other protection services are offered through BBVA Compass Insurance Agency, Inc., an affiliate of Compass Bank. Insurance products are not available in all states.